Set a few years before the events of "Episode IV A New Hope," the game lets players rewrite history as well as experience the aftermath of "Star Wars: Episode III Revenge of the Sith," the creation of the Rebel Alliance, and Darth Vader's rise to power. Using an entirely new game engine created by the Las Vegas-based developer Petroglyph, Star Wars: Empire at War features beautifully rendered land and space battles set on memorable planets such as Hoth, Tatooine and Dagobah as well as never-before-seen environments taken directly from the Star Wars films and expanded universe novels. In the game, players can choose to join either the Rebel Alliance or the Galactic Empire, building and setting up tactical forces that can be unleashed on the enemy in real-time 3D. All of the gameplay and action within Star Wars: Empire at War is a persistent, meaning that strategic and tactical elements from previous events will have a permanent effect on the galaxy. As players build, manage and progress their space and ground-based units, troops and vehicles, memorable Star Wars hero characters will begin playing a role in key situations. 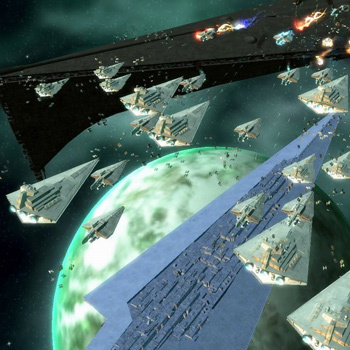 In addition to the single player campaign mode, the game includes a two-player Empire vs. Rebellion mode and up to eight player online skirmish modes.